The 2015 Season of Extreme Barbie Jeep Racing has been one heck of a wild ride to say the least. We have been all over the place bombing hills on these sketchy little machines. It all came down to our season finale that takes place every year in the small town of Delta, Alabama. RBD is the name of the event and we are the Sunday sideshow. Ricky Berry holds the event every year to celebrate his Birthday with 1200 of his closest off road friends. This is the place where I first piloted one of these plastic chariots of death and I have been hooked ever since. This year’s race was sponsored by yours truly (Busted Knuckle Films) with the Highest Payout in Extreme Barbie Jeep Racing History of $200. It doesn’t sound like much but considering the fact we get these toys for free it’s not a bad payout. It should atleast cover your Copay at the local Hospital, but If you need a doctor you probably didn’t win. We have 7 racers show up to tackle this beast of a hill. The Rules are simple. It is a Single Elimination format. We start at the top of the hill with an arm drop and you must cross the finish line with at least half of your vehicle. If you lose you are out, if you win you go back up the hill and run someone else who won until there is a winner. You must wear a helmet and have a power wheels type vehicle with a steering wheel and plastic tires. Other than that you are completely open to do whatever. Some people even paint and customize their vehicles. Our favorite of this year was the Murder Gator made to mimic the famous Murder Nova Car. I started off in my yellow gator deemed Lil’ Plowboy against Colby Rodenberry is his Red Jeep. As soon as Ricky dropped his hands I was off and never saw him again as I made one of the fastest passes of the day. Colby rolled about half way down the course but got back on and finished strong. Next up we had a Truck vs a Gator. The Gator led the race all the way down the course but paid the price after he got sideways and was ejected across the finish line in one of the best crashes of the day. Then we had a Hurricane and a Jeep Battle it out. The Hurricane pulled away from the Red Jeep as it crashed at the top of the hill just before the Hurricane driver hit the bank and was ejected across the finish. JD Taylor was up next against the Murder Gator. He front flipped out of the first turn as the gator pulled away finishing in style with missing a front tire and wheel. Next I raced a fella in a pink jeep I almost laid Lil’ Plowboy over on its side in the first corner but recovered quickly and finished fast. Too fast as I ran into the woods at the bottom of the course losing my shoe in the crash. The Murder Gator driver borrowed a jeep to race in the semi-finals but lost a close race to the black truck. That left only two. Me and Lil’ Plowboy vs the Black Truck.I leapt out of the gate leading by a fender bashing back a forth half way down the course before the truck lost steering leaving me with a smooth race to the bottom for the win. That leaves Busted Knuckle as the RBD Champion and undefeated for the entire 2015 Season taking home $200. There were plastic pieces and parts strewn all the way down the course with a graveyard of barbie jeeps piled up at the bottom. Everyone had a blast and no one had to go to the Hospital. I would say that is a success. 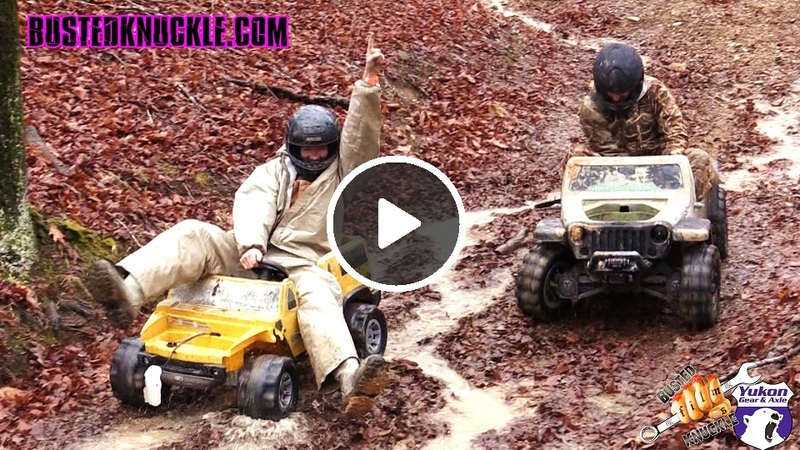 For more Extreme Barbie Jeep Racing Videos Check out the Busted Knuckle Youtube Channel. Check out the video below for even more Insane Barbie Jeep Racing Action!